In Luke 17:28-29, after comparing his sudden, unexpected coming to the days of Noah, the Lord compares his coming to the days of Lot. Lot and his family, as you may recall, were rescued/taken out by angels (see Matthew 24:31). The SAME day that they were taken out, Sodom was destroyed by fire. The Lord sent angels to rescue the righteous, and on the same day, he rained down unexpected fire to destroy the unrighteous. This is a reference to a worldwide event! Jesus says “in that night” but he also mentions daytime activities like grinding and working in the fields. The ONLY way for something to happen “in that night" and also happen during the day is for it to be a global event. What happens in this global event? Some people are taken and some people are left. And what is meant by the word “taken”? Is this a reference to the Rapture? Yes, in this passage it is. The Greek word for taken (in Matt. 24:41 and Lk. 17:34-35) is paralambano meaning to “receive near,” i.e. to associate with oneself (in any familiar or intimate act or relation). The idea is to take to oneself. Noah and Lot were the ones who were TAKEN. 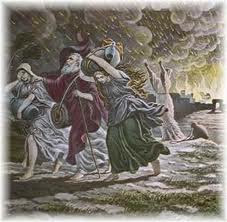 Noah was taken from among the people of the earth just before they were destroyed. Lot was taken from a city just before it too was destroyed. The Lord received them to himself, just as he will take us to himself on the SAME DAY that He destroys the unrighteous who are not taken.